After GROWing a letter in a word by one or more pixels, I tried to STROKE the action and it didn't seem to work properly. I would like the letter to be totally filled with its solid color... but instead, it just seemed to outline the letter, leaving white space between the new GROW line and the actual letter. Can anyone tell me how to end up with a "fatter" letter that's completely filled? (Feb 7, 2014 21:53)GOO-GOO HEAD Wrote: After GROWing a letter in a word by one or more pixels, I tried to STROKE the action and it didn't seem to work properly. I would like the letter to be totally filled with its solid color... but instead, it just seemed to outline the letter, leaving white space between the new GROW line and the actual letter. After growing the selection, Bucket Fill the selection with the same color, making sure the 'Fill whole selection' option is on. copy the letter onto a new layer using the with space around it. 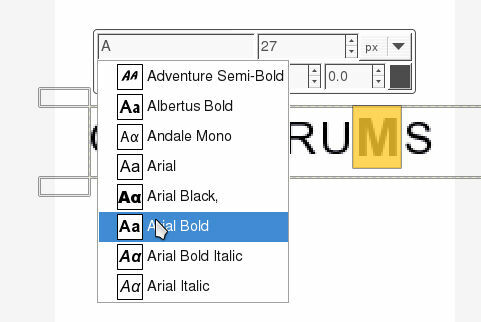 *If there are spaces between the letters, you'll need to click the bucket fill for those letters. Do not overlook the obvious. 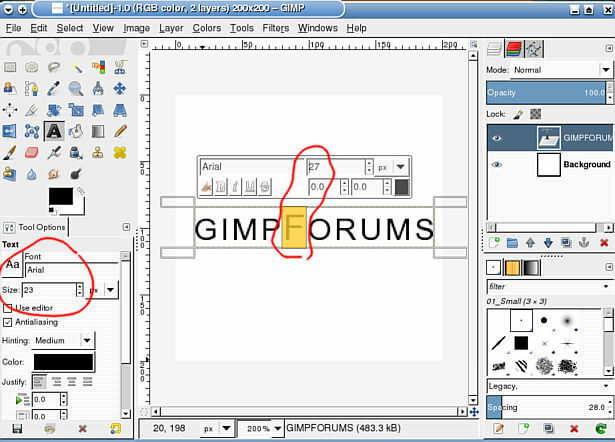 The text tool will adjust individual letters. The text is entered globally with a size of 23. An individual letter is selected and the size increased to 27 using the on-canvas dialog. edit: another example where character size, baseline also font, changed for the selection.